1. Chanel Rouge Coco 416 Coco is the first real orange thing I bought (I made a big deal of of it here). The formula is light yet creamy and moisturizing. This orange has very fine (almost invisible) shimmer with some red undertones and appears semi-glossy on, which makes it wearable for most people. 2. 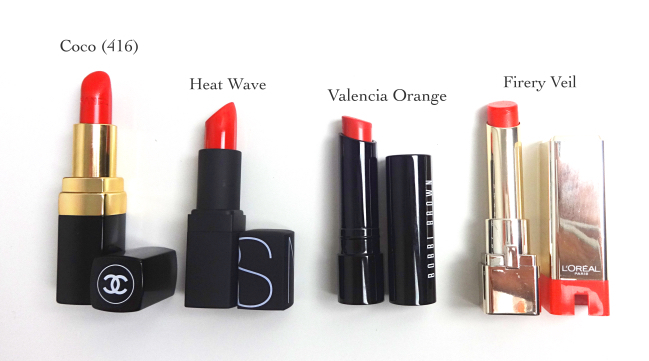 NARS Semi Matte Lipstick Heat Wave is an amazingly beautiful orange red that really stands out. The matte formula is awesome as well. I will review this in depth soon. 3. Bobbi Brown Creamy Matte Lip Color Valencia Orange is a gift from Liz (Jamilla Camel). She thought I should wear more orange! ;D Valencia Orange is a medium matte orange with a bit of terracotta undertones that turns redder on my lips. It is a very unique color in my collection. 4. L'Oreal Colour Caresse Lipstick Fiery Veil was an awesome find from a discount store in downtown. I have mixed thoughts on the range (which seems to be discontinued) but this particular orange is glossier and juicier than other shades I've tried. I love it even more since I only paid $3 for it. 1. 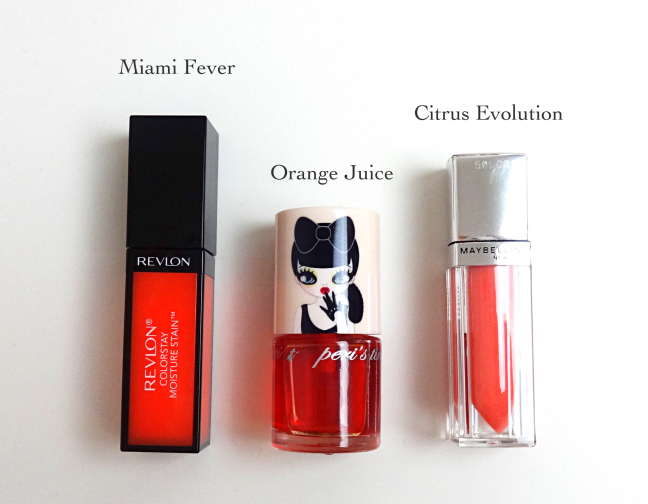 Revlon Moisture Stain Miami Fever is a hot orange stain. I like this range and have a few more colors but never thought this sizzling orange would become my favorite. 2. PeriPera Peri's Tint Water Orange Juice is probably the most orange thing I own. I reviewed it here and did a full face with it here. 3. Maybelline Color Elixir Citrus Evolution is an LE from some spring collection, and is another discount store find at $2. It is a creamy yellow peach with no shimmer and its nice formulation is indeed similar to L'Oreal Extraordinaire. Unfortunately, my weird nose prefers the L'Oreal scent (both are strongly and unnecessarily fragranced, by the way), so I won't grab more of the Maybelline. 1. M.A.C. Powder Blush Honey Jasmine is a hard-to-find LE shade from Larie (Eye Heart It)'s blogsale. It is a golden orange with a matte texture and maintains a great clarity when applied. You can find my full review here. 2. Chanel Joues Contraste Canaille is from Liz (Beauty Reductionista)'s blogsale page, and it just arrived with perfect timing for this post. (The blogsale is still going on and you should check it out.) Honestly I wasn't so sure about this burnt orange blush, but it is undeniably beautiful. Canaille is deeply pigmented and has the most gorgeous satin finish. 3. Revlon Cream Blush Coral Reef is slightly out of place since it is a coral, but it feels right to include it since the color shows up decidedly orange-y on my cheeks. It is very easy to blend out for a natural look but isn't all that long lasting. I will review this and the other color, Flushed later (it's hard to say "soon" at this point). I only have two and don't feel the need of getting more. Both have red undertones and gel-creme finish, which is why they are very flattering and wearable. 1. 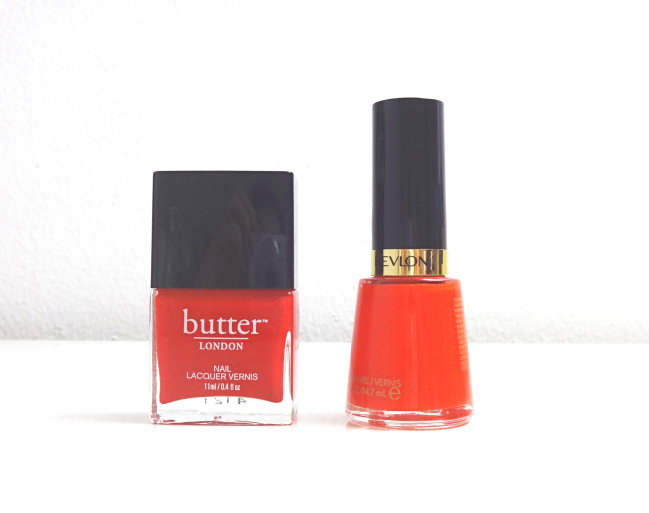 Butter London Nail Lacquer Ladybird is a orange red, and 2. Revlon Nail Enamel Provocative is a reddish orange, and I'm appreciating the difference. You can find NOTD and comparison posts here and here. Hope you enjoyed this collective post. Nice orange collection! I don't own a lot of orange either, it really clashes a lot on me. But I have a Clinique Matte lipstick that I really like and it's orange! It's all about the tone I guess! Thanks, Tracy! I'm quite happy with my orange things, and this is really enough for me at least for now. I love color stories like this. This is a such well-edited collection of oranges! My favorites would have to be the Chanel Rouge Coco in Coco (fun to say) and the MAC Honey Jasmine blush. The orange tint water from Peripera I'll definitely have to add to my collection. You wear orange well! I usually just buy safe colors when it comes to higher-end lipsticks (because I gotta get my money worth, right..? ), but I'm glad I took a chance and went for Coco (416)! It is really unique and sophisticated shade. I wanted to pick up Heat Wave the other day but I ended up with Fanny because it was more Autumn appropriate and looking at the swatch, I'm really regretting it. I have yet to try Revlon cream blusher, I know it must be good as Lisa Eldridge recommends it too. Two things I'm planning to buy after reading this post, Revlon cream blusher and Moisture Stain, can't believe I have yet to try both until today. Hi Shreen! :) I just googled up Fanny, and my that is a gorgeous purple berry! I'm not a big fan of the Audacious range itself, but that's just me since I prefer sheer lipsticks by much. I thought NARS soft matte lipstick would be drying but it isn't at all. And Heat Wave is certainly worth having if not for everyday color. I have to take out Canaille again and try it. I used it like 1-2 times and I was horrified but maybe it was the brush or I didn't know how to blend it properly or combine it properly back then. Some seriously bold and stunning shades you got there Lena! I'm not a fan of oranges though, never have been but recently I've been getting into peaches for the cheeks. 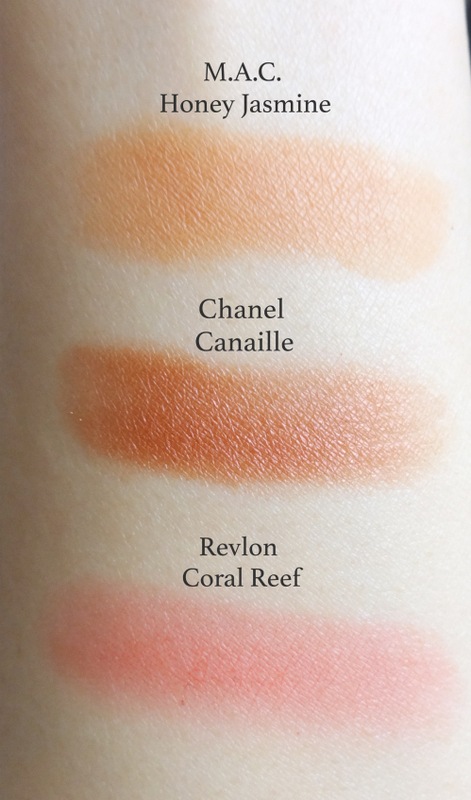 I seriously am in love with your Chanel blush, love that kind of warm earth tone! I hear you! And you wear pink, plum and berries so well! 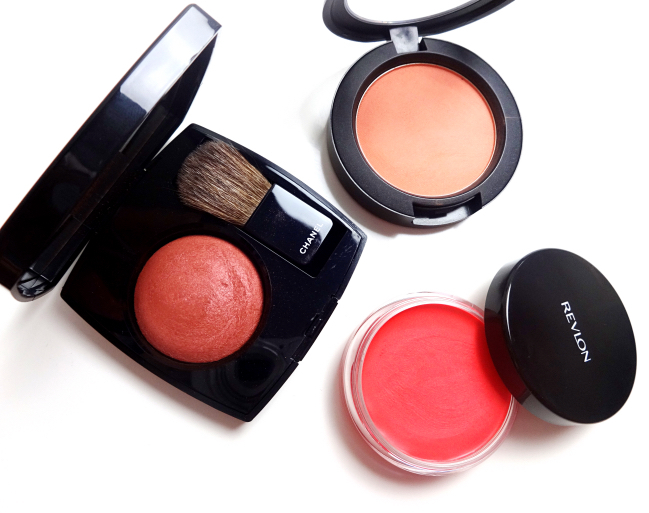 Peachy blushes with a bit of pink undertones are the easiest ones to pull off. I think I started from there as well. And I definitely agree with you. I only have 3 Chanel blushes currently which were all from blogsales (I did use one up a very long time ago. Haha), and they are amazing! I think I'm going through my kind of decluttering and will be showcasing what stays in my collection. This is a great reminder both - "I have enough pretty things + Oh, I think this is missing from my collection." Nice collection. I love reading color-themed makeup collection posts :) Really help in seeing what you got in your collection. I don't have too much orange in mine. 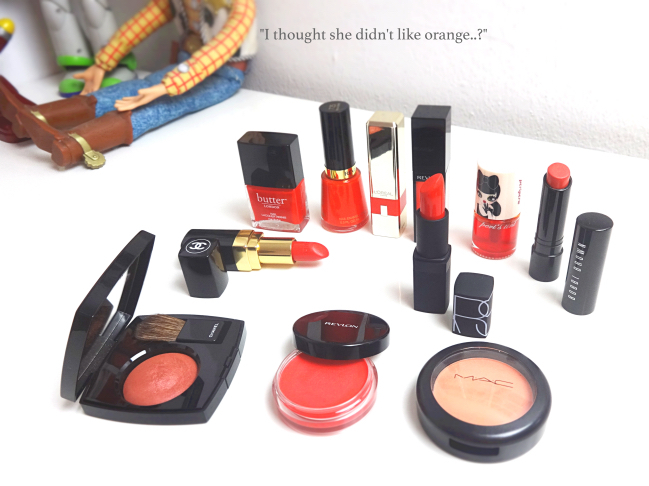 The closest I got is some coral blushes and lipsticks. This was such a gorgeous post...with so much bright colors :) I love it! I think you wear refined peaches with softer hues so beautifully, though. Maybe oranges are not too difficult for you. I do enjoy orange - I think it generally flatters Asian skin tones and it's a bit left of field but not too "unwearable", especially since there are so many options available. Orange lips are always fun to sport in summer - I remember Lisa Eldridge did a video about them based upon a Keira Knightley look she did for an event. NARS Heat Wave looks so stunning! I wish I was more openminded and embraced the fact there are many different tones in "orange" and different finish also weighs in how I wear a certain shade. I still find yellow toned orange (as in orange crayons) very difficult to wear (especially on my nails), but now I feel much comfortable towards "tangerines". Coral is my cheat color as teal is for green. I think added pink makes things much easier to pull off, but as you see here, I got a little adventurous! I've already showcased a few looks on the blog, and I am looking to do some more in the future! Beautiful collection, Lena. The lip colors are too bold for me but you pull them off so well! If I wear orange, it's a muted coral version! I bought a powdery straight-up orange blush a month ago (just so that I can wear it in fall) and also bought a cargo laguna after swatching it for like 68 times in Duane Reade...I totally went crazy for orange back in 2011or so, now I advanced to orange eyeshadow(I blame my new found interest in jaundice/eye infection on korean k-pop girls/I don't even listen to kpop ...) I am still researching so far but the hoarding shall begin when it gets sunny again. I didn't know Duane Reade carries Cargo! Cargo is actually my first blush brand love. I should check out the big DR location on the block. They are all beautiful! Particularly Valencia Orange. I don't know why but I've been put off oranges for some time. It's weird because I have so many in my collection, I love the color.